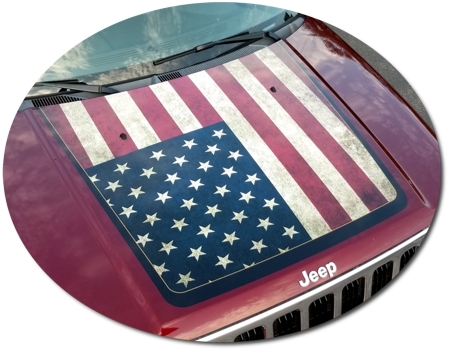 Make your '06-'10 Jeep Commander's Hood stand out with this great-looking Patriotic Edition Hood Graphic kit. Digitally printed in a unique weathered and tarnished American Flag design with our DuraCOLOR graphic technology, kit is manufactured with premium automotive grade vinyl film materials. As a further step, graphic is covered with a 2.0 mil clear laminate (gloss or matte) which looks great and provides protection from miles of abuse. Kit is specifically made for the '06-'10 Jeep Commander's factory Hood and will not fit any other vehicle. Graphic kit is vehicle specific and will fit any '06-'10 Jeep Commander's. It will not fit any other vehicle.